» A mud volcano as an Earthquake Environmental Effect? 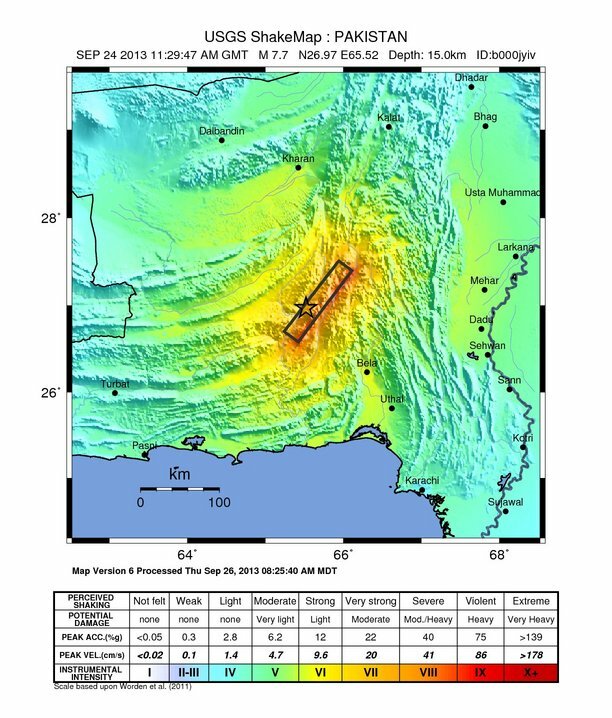 On 24 September a shallow M7.7 earthquake rattled Pakistan. At least 300 people died and thousands of houses, most of them adobe, collapsed in Balochistan Province. The quake was felt as far away as Muscat (Oman) and New Delhi (India). Epicentral intensities reached up to IX. The earthquake appeared to be a strike slip event. Soon the media reported on an amazing effect of the quake – in roughly 400 km distance a new island appeared few hundred meters off Gwadar. USGS reports on a maximum fault slip of ~13 m of the EQ and ~150 km rupture length, which in my opinion is a relatively large amount for this magnitude. The new island of course caught almost all the attention. It is reported to be “18 meters high, 30 meters wide and 76 meters long” (National Post). The island is named Zalzala Jazeera and will most likely soon be washed into the sea, but it already has its own wikipedia article. Almost everyone agrees that a mud volcano was activated or created by the earthquake – since the island is a few hundred kilometers away from the epicentre, coseismic uplift can be ruled out. Witnesses also report water bubbles containing an inflammable gas and dead fish, which supports the mud volcano theory. 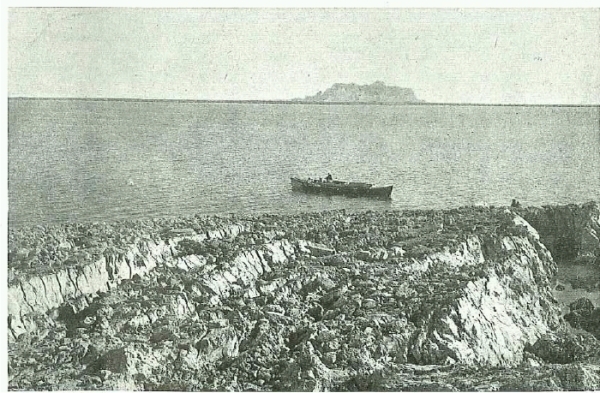 From the video the island appears rather solid and not very muddy. Other mud volcanos such as Lusi produce more liquid material. Even things like shear planes and cracks are visible on some photographs and people walk across it, so ‘mud’ might not be the right term. Other things are strange, too. The location is far away from the earthquake epicentre and I guess it must be questioned if the seismic shock really triggered the rise of the island. Can liquefaction have played a role? Then I guess we would have seen liquefaction onshore in the Gwadar area, too. Plus, wouldn’t we have this phenomenon more often then? With closer but smaller earthquakes? Mud volcanos as Earthquake Environmental Effects (EEEs)? Is there a clear distance-intensity/magnitude relationship? Does the size of the mud volcano correlate with earthquake magnitude, peak ground acceleration (PGA), shaking duration etc.? Does a sedimentological record of mud volcanoes allow to conclude on paleo-earthquakes? Until now we have no news about other EEEs like primary surface ruptures, hydrological anomalies or other effects, but I am sure a local survey would be successful. Until then I’ll follow the news and see how the island is washed back into the sea. Manga, M., Brumm, M. & Rudolph, M.L. 2009. Earthquake triggering of mud volcanoes. Marine and Petroleum Geology 26, 1785-1798. Snead, R.E. 1964. Active Mud Volcanoes of Baluchistan, West Pakistan. Geographical Review 54-4, 546-560. Sondhi, V. P. 1947: The makran earthquake, 28th November 1945, The birth of new islands. Ind. Minerals 1: 147-154.
here is a great aerial view of the island. def either a mud volcano, but possibly a mud laccolith. some would argue they are the same… others would differ (the only difference being that a mud laccolith would not pierce the surface). given that the sea floor was uplifted with rocks exposed on the sea floor, i favor the laccolith interpretation. mud volcanoes seem to be more depositional in that they emit mud to the surface, depositing this mud until it builds up some relief. this is not apparent based on the 1945 nor 2013 photos. if one looks at photos/images of what people generally agree are mud volcanoes, they successively deposit material on top of the ground/seafloor surface (building up topography in the form of an igneous volcano). this clearly did not happen in 1945 nor in 2013.
it could also be that some gas destabilization caused the uplift of the seafloor sediments. of course, that is not a mud volcano either. the anecdotal accounts in 1945 support this hypothesis. here is another update that supports the cathrate destabilization explanation for the uplift of the seafloor and discounts/nullifies the mud volcano explanation. ironically the landform is still referred to as a “volcano,” but this is likely due to the layperson audience of this web site (while being technically incorrect). The term ‘mud volcano’ doesn’t fit the observations. But if it was a laccolithe, then we would now see the uplifted sea floor. Could this look like that? So, we have a kind of methane-emission-related uplift of the sea floor? Is there anyone out there who has an idea on the bathymetry/the amount of uplift?